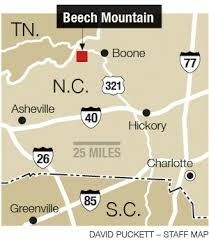 The Land of Oz – The Land of Oz is a mostly now-defunct theme park located in the resort town of Beech Mountain, North Carolina. It was opened in 1970 by Grover Robbins, who had been successful with Tweetsie Railroad, and was fully operational until 1980. The park was based on the book rather than the film. This is a park that almost was. The good news is it’s been revived for special seasonal events, not in all its glory but to serve the community and pay homage to its creator and his inspiration. The link provided gives upcoming events, history and photos. 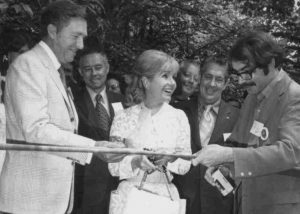 Another trivia fact I learned was when the park opened it was by Debbie Reynolds, accompanied by her then little-known daughter Carrie Fisher. How this came about is another interesting story, with a link provided. In its first summer 400,000 visitors came to the Land of Oz. In fact, during the designing phase employees were told not to watch the movie but rather read the book. The costumes of the actors were in fact based more on the book descriptions until later on in the park’s history when they were changed to look more like the film. Visitors could take a walk down the Yellow Brick Road, “experience” the cyclone which struck Dorothy’s house, and visit with the Scarecrow, Tin Woodman, the Cowardly Lion, and the Wicked Witch of the West. 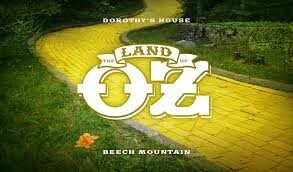 The Yellow Brick Road led to a show at the Emerald City where the characters met with the Wizard. An artificial balloon ride, a specially modified ski lift installed by Goforth Brothers, allowed visitors to get a bird’s-eye view of the park and mountain scenery before leaving Oz. A small museum showcased props and costumes from the film. These were jointly bought by the park and Debbie Reynolds from MGM. 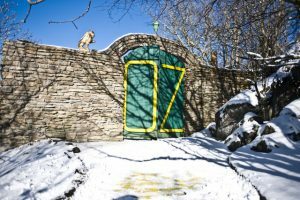 Land of Oz opened in 1970 with the intention of extending the ski resort to be a ‘year-round’ attraction by offering an attraction at the pinnacle of Beech Mountain. A ski lift was specially designed to become the hot air balloon ride which has since been redeployed to be a ski lift on the back bowl, now Oz run, of Ski Beech. In later years, characters from the story conducted tours, but the original design was for the visitor to assume the role of Dorothy – experiencing everything from Kansas to tornado to the meeting the characters on the yellow brick road to Oz. The visit culminated in Emerald City, where Dorothy appeared with her friends to meet the Wizard. The park was the top attraction in the southeast the first year. Its opening day in 1970 attracted 20,000 visitors. Dampened by the death of owner Grover Robbins a few months before the park opened, the driving force to keep the park as a special experience gave way to commercial necessities foisted on Carolina Caribbean Corp by the downturn in real estate sales. Emerald City burned on Sunday, December 28, 1975, destroying some artifacts, including the dress worn by Dorothy in the movie. There is some speculation that the fires were set by disgruntled employees who were angered at having been dismissed for legitimate reasons. Land of Oz finally closed in 1980. At the top of a winding North Carolina mountain road is the entrance to Oz, a 1970s theme park abandoned less than 10 years after it opened. In its heyday the Land of Oz could attract 20,000 visitors a day, but now the neglected Yellow Brick Road is missing some bricks, the Wicked Witch of the West’s castle is empty and the Emerald City has disappeared. Thank you for looking at my site. It is a “retirement” project I envisioned for a few years, before launching it a year ago. As my blogs have developed over this year, I found inspiration in unexpected ways. Please share with other who may benefit. Namaste! I will right away grab your rss as I can’t find your email subscription link or newsletter service. Do you’ve any? Please let me know in order that I may subscribe. Thanks. You can also find it on Facebook. I set up my blog, not as a discussion format, per advise, but more as a service to promote hope and strong women. Thank you for interest and comments. I just want to say I am all new to blogs and certainly enjoyed your web site. Almost certainly I’m likely to bookmark your website . You amazingly come with amazing articles and reviews. Bless you for sharing your web page.